I am sitting on the beautiful beach that is my backyard, after an early morning sunrise run reflecting on this past year. As I watch the fishermen go by in their boats I am in disbelief that it is already June and the last week of school! This first year of teaching in Haiti has absolutely flown by, and while I am very much ready for a break, I don't know if I'm fully ready to have my first year of teaching in Haiti come to an end! To describe this year... wow. Where to begin? I was stretched so much in ways that I am still processing! There were many challenges and celebrations, and I truly wouldn't change a single thing. Personally, the Lord has been moving mountains in my heart and drawing me deeper and deeper to Him than I ever thought possible. From the scary bold leap of faith to initially move here, to the daily joys and struggles of living on mission in a developing country. Between being stripped of my normal daily comforts and having to rely on the Lord daily, to living amongst such heart breaking poverty, to embracing a missionary community and their rule of life and rhythm of prayer. God has been abundantly good to me. A friend of mine described missions in Haiti as a "pressure cooker for virtue" and how true it is! If I am authentically praying and being obedient, then I have no choice but to grow in virtue, everything else is choked out! I feel like I am being broken down and remade new in a very slow intentional way. Even though there are some days when I feel ready to quit and come home, I am so thankful for the gift of this call and for this challenging beautiful life. As far as my role in the school (not sure the title of teacher quite captures it), every single day held a learning moment this year. How humbling to constantly be learning a new lesson. Most of the year, I felt like I was in survival mode, a constant state of being overwhelmed. The beauty of that place is that I have no option to rely on my own strength and thus am forced to rely on the Lord. This year, I had my fair share of mistakes, from accidentally offending someone because of my lack of cultural understanding to constantly making a fool of myself in my lack of Creole skills--the list goes on. At times I was discouraged knowing no matter how hard I try and how long I live here, I will never fully understand this culture or language. Some days I cried at how slowly I was learning the language, or how frustrating it was to constantly be taking one step forward and two steps back. Other days I saw photos of my friends' lives in America and thought... what am I doing here? I battled with the fear of how I will one day go back to America and try to be "normal". And the challenge of feeling like I don't quite fit in in either place. And yet with all of that there has been an underlying peace, freedom, and true JOY. My heart has come alive. In all of my weakness and messiness and failing, there is a quiet strength growing that is beautiful. Thankfully, I have slowly begun to understand family dynamics and daily life and education in this small Haitian village. I can't begin to tell you all the funny sentences I have said and thought & the hilarious situations I have been in this year that I never would have imagined. I need to start writing them all down because at least once a day I stop and think, "what is my life!?" Because it is so NOT normal. While a tendency of mine is to feel like my "real life" is on hold while I am in Haiti on mission, the Lord has been prompting me not to do that. This, although a bit odd and different, is my real life, and it is a good one. I have been trying to invest into life here outside of the school day in small ways like finding hobbies, such as joining the choir or going on runs, making friends, setting boundaries, and practicing self care. It is an ongoing balance of trying to be present here while also staying connected to my family and friends back home. And it is the most challenging feeling in the world to have your heart in two places at once. I know the Lord wants me to be here right now and is pleased with my desire to be faithful, even if at times I don't feel successful. He has been showing me such beautiful fruit that has already begun to grow. Over the past year, a school community was formed in which nine sweet children were brought together to learn and laugh and grow. They were taken in and loved and cared for in all their silliness and smiles, and their sicknesses and hardships. I have seen such growth and new life in these children that was not there when the school year began. We have journeyed with their families, built up a school staff, and unleashed opportunities for adults in our community to have a path to help them provide for their families. We have reached countless more children on the streets and in their homes and shared with them the love of the Good Shepherd through after school neighborhood catechesis. The fruit is continuing to come to life and I'm holding on to that truth! Amidst all that goodness, the past few months have been full of prayer of what is next for Reveye. Asking the Lord what He desires and seeing what doors He opens and closes. In my prayer I've been voicing both really bold prayers and very small humble ones. Despite there still being many uncertainties, I feel total peace that Reveye is moving in the direction it is meant to. The Lord is slowly unveiling what He has in store for next year and it is really really good. This past month I have had several opportunities to share the story of Reveye with visitors and new missionaries. It has been so good for my heart to share all that the Lord has done with and through Reveye thus far. I am constantly reminded anew of all the ways the Lord has provided up until now, so why get anxious about what is next? I know He will keep providing in abundance. God is so good and is comforting me in all of the uncertainty. We will be having a LOT more students in our school this fall! Yesterday was inscription day, which was just shared by word of mouth, and we had people lined up for hours to sign up. So far, we have had 37 applications!! This is a little unreal for me to think about, especially considering our small start of just 9 students this first year. What an encouraging confirmation that our school is filling a need for this community. Most of the parents who came to sign up their children were unable to read or write so we sat with them and read them the school expectations, and filled out the application with them. We are still praying about how many and which students we will be able to accept. 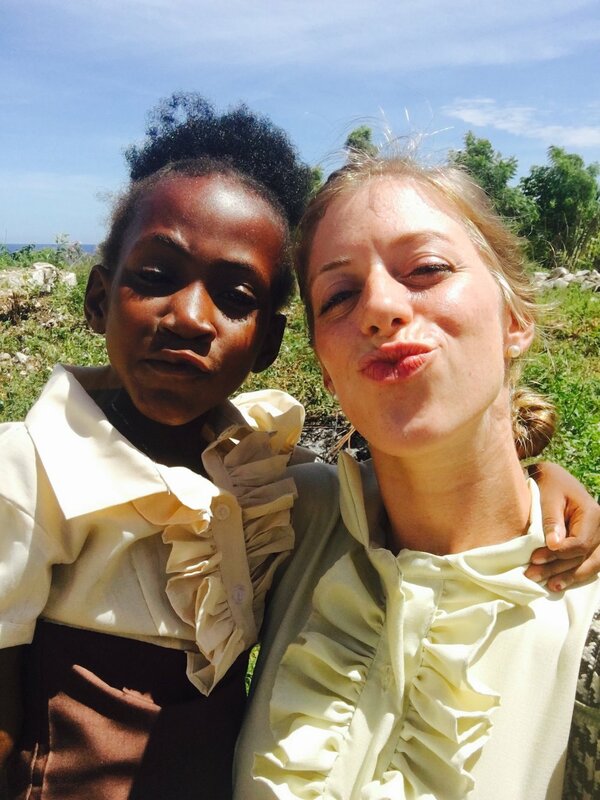 We will be sending my two teacher assistants to a year long training program in Liancourt, Haiti. They will graduate next July and will then return to our school as certified Montessori teachers! It is beautiful to think this is an opportunity that neither of them would have had, yet because of the school they now have an exciting path unfolding for them. We will be hiring at least two new teacher assistants for next year. We have already hired one and I have been prayerfully "interviewing" (this looks quite different in Haiti) to decide who else will join our staff. Again, I feel so grateful that I am able to offer a job to people who otherwise would not have one. This is a fruit of Reveye that I had never even considered but the Lord is blessing it and providing. Our catechesis program will be growing in big ways, although the details are still moving and shifting. I am personally so excited about the direction I feel this taking! There are several other exciting prayers in the works that I will share as they take shape! For now, I am living into this last week of the school year, preparing for our kids summer camp next week, and then receiving the gift of spending my summer break at home; something I had not originally planned to do but for which I am grateful. Please pray for me to be docile to the Spirit and open to whatever the Lord wants to do with Reveye. Pray for me as I go home, for it to be a time of restoration and fullness and preparation for another year on mission in Haiti. I am unceasingly grateful for the prayers, support, encouragement, and accompaniment that people from all over have been showering upon this mission and upon me. Newer PostHome Sweet Haiti- Year 2 Begins!